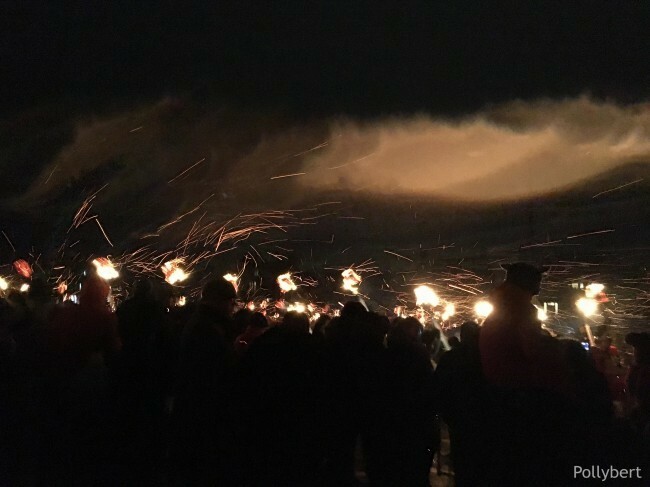 Shetland at the end of January celebrates the Up Helly Aa festival. This was the main reason I wanted to travel to Shetland. 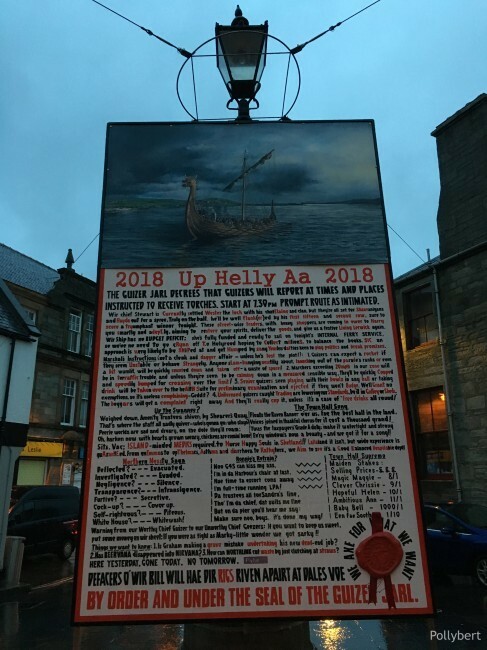 To see the Up Helly Aa festival on the last Tuesday of the month. 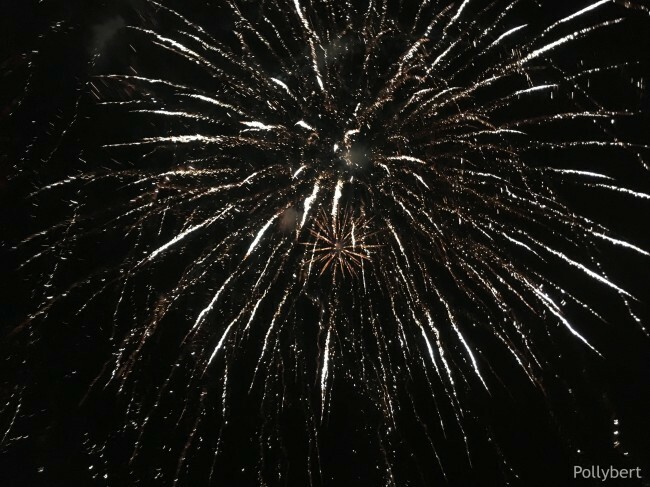 It is celebrated on or around this day since the 1880s with a few notable exceptions (e.g. WWI and WWII). That this island turned out to be absolutely gorgeous (see South, Northwest and West of Shetland) and has the friendliest people was a nice surprise. 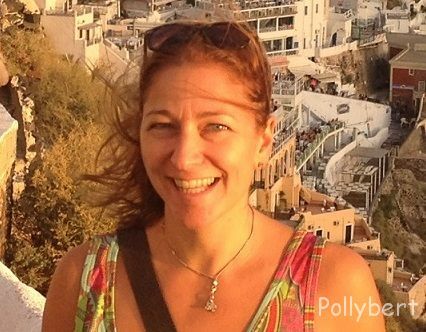 But the festival had been on my must-see list since some time. I needed to know what the hype was all about. 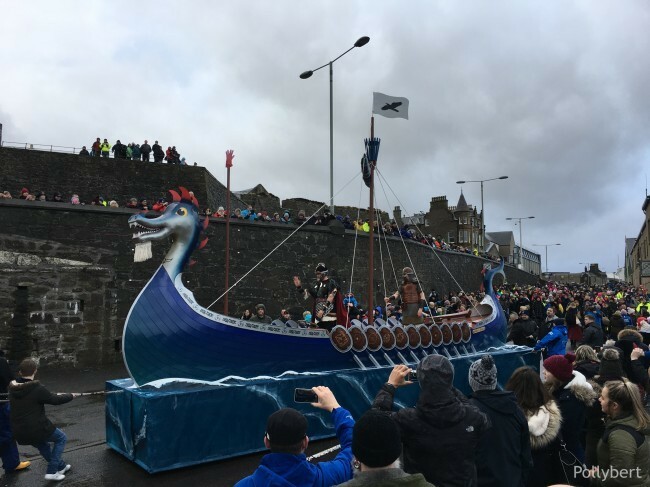 Processions and celebrations are going on all around the island, not only in Lerwick. 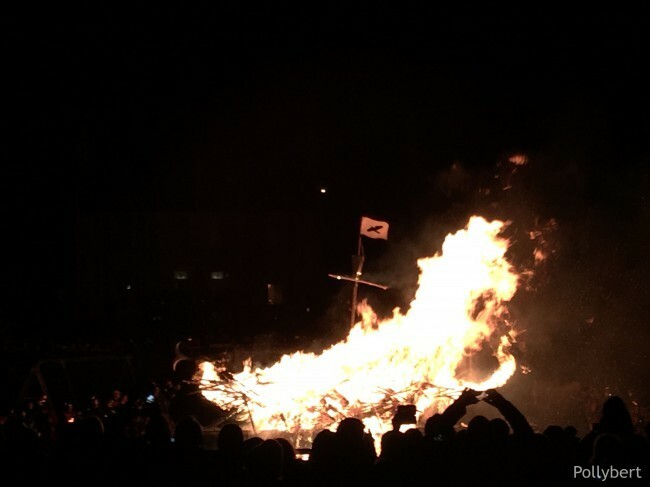 Although the festival in Lerwick is the biggest and most well-known one. The day starts with a Bill of proclamation at Market Cross. As you can see the proclamation is by the order of Guizer Jarl who is the leader of the Jarl Squad. The costumes, weapons and shield of the squad are each year anew designed and made by the squad members. 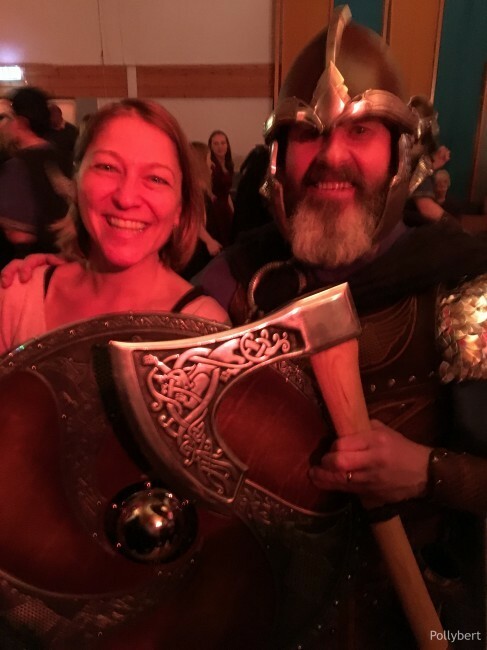 The suit of armour of the Jarl on the other hand is handed down from the previous Jarl. 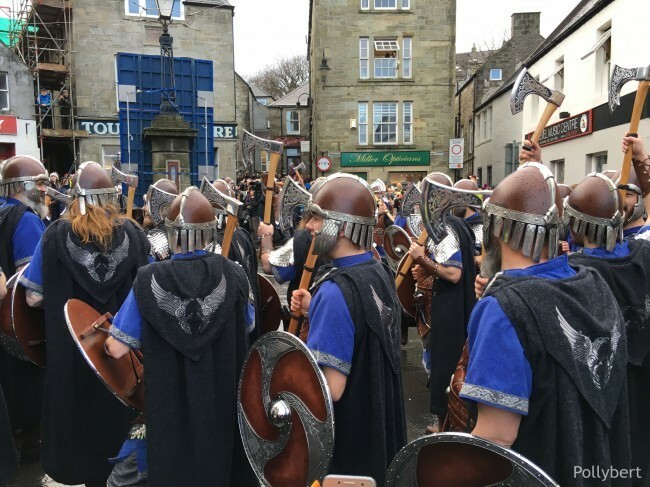 The procession of the Jarl Squad started at 9am. Now we had finally a chance to get a first glimpse of the Vikings. We took up a position right next to the ferry terminal where the Galley was to be placed. Of course seeing the Vikings live was a lot more impressive. Click here to see for yourself. we moved back to the Galley to listen to the bagpipes while the Vikings got their picture taken on the Galley. 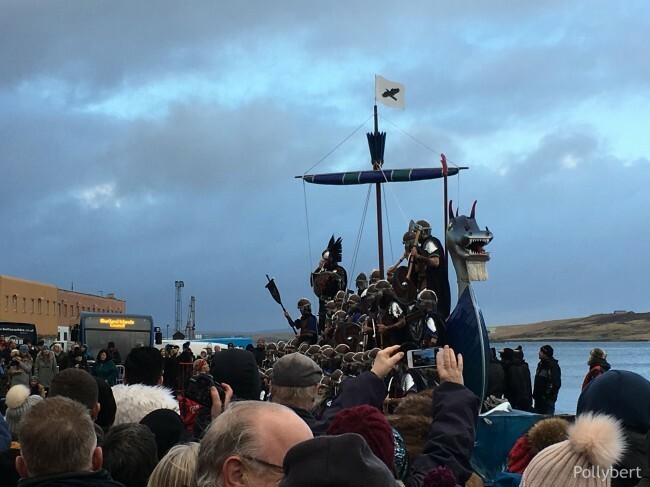 The rest of the day the Vikings move around town and have different appointments with the locals like visiting the museum in Lerwick. 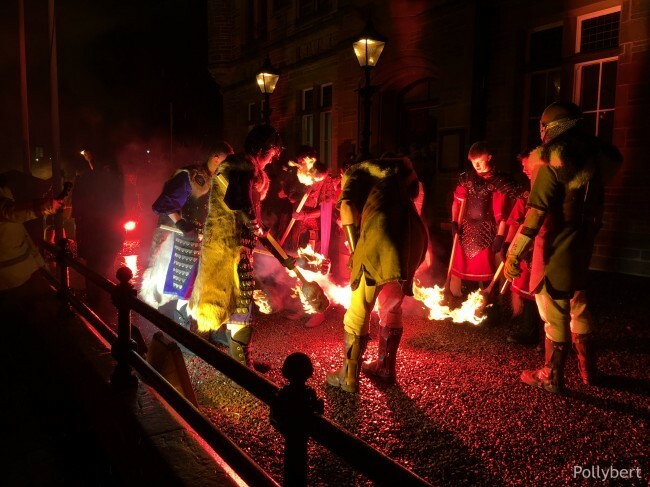 We did much the same just without the Vikings but with a stop at the Garrison Theatre to enjoy the Fiery Sessions. 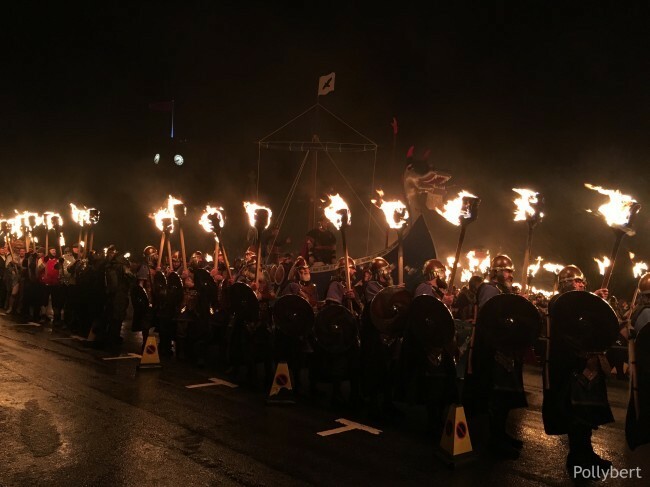 The real festival begins in the evening at 7pm when the Vikings and all other squads assemble and light up their torches. At 7:30pm sharp the lights go off and the only light comes from the torches. The whole scene feels eerie especially at first when the Vikings pass you by. Their blood curling cries help to easily imagine how it could have been during attacks. The procession comes by twice, rounding a park, and then takes up its position around the Galley. 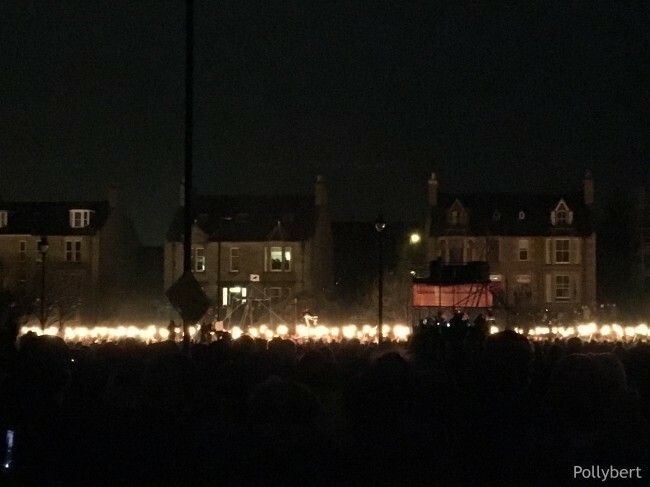 Watching the length of this torch procession, easily about 900 men, I just couldn’t stop being amazed. It looked fantastic. I have to apologize though for the picture quality, I was afraid to come any closer. Fireworks concluded the torch procession and in the dark night the lights were so much brighter. If you think that was all, you are sorely mistaken. The party only started after the procession. We were lucky enough to get tickets for one of the halls (there are 11 in total) through the waiting list and the help from the tourist office in Lerwick. They were the nicest people and so helpful, I can’t stress that enough. 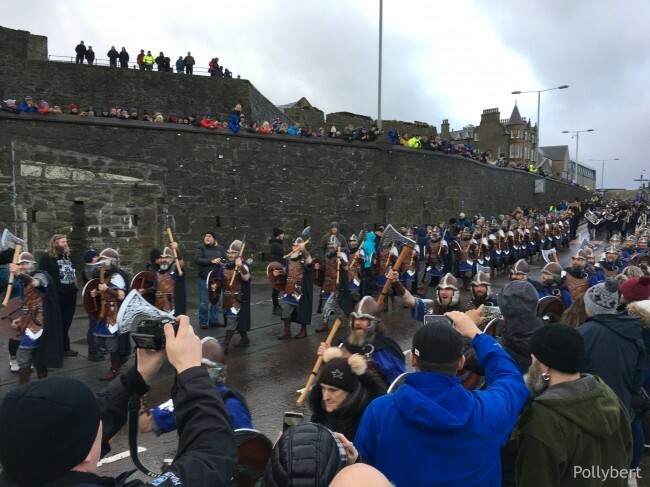 bagpipes, Europe, festival, long weekend, music, Scotland, Shetland, travel, traveling Europe, traveling with friends, Up Helly Aa, weekend trip. Bookmark.